Call your Realtor now and tell him to grab his gumboots because you want to go see some homes in the morning. Sure, summer is a great time to go see homes when the sun is shining, everything is in bloom and homes look their best. However, personally I think the best time for a buyer to purchase a home is during the dark and dreary, miserable and wet months of the year. A good continuous dose of rain can help reveal a whole host of issues that might remain hidden, or at least a lot harder to find, during the drier spring and summer months. Plus there's a lot less competition for homes during those times of year. Rain will help both the buyer and their agent when they are out looking at homes and considering making an offer. Also helps your home inspector look really competent. For non-Seattleites, it's probably hard to believe that from about mid June through mid September, we usually get next to no rain and have one of the best rated summers in the US (we like to keep that quiet). We don't get the heavy lightening storms and downpours or hurricane rains some other parts of the US enjoy during the summer months. But come fall and winter...hold onto your Seahawks hats...you'll have the urge to build an ark in the backyard just to be on the safe side. While writing this piece, we had THE wettest October on record. And to think I moved from Ireland for this! On the upside, all that rain, wind and moisture is a great little helper when looking to buy a home. If you can time it for when a Pineapple Express is barreling in from Hawaii all the better. But regardless of which part of the US you live (including desert monsoons) rain and his buddy Mr. Wind, will help reveal all. Rain and moisture will rot your home. There's no point having a Houzz-worthy kitchen with all the latest bells and whistles if the roof is rotten or water is pouring into the crawlspace with no where to go. It is crucial to take care of the critical structural envelope of your home first before treating yourself to new countertops and the likes. 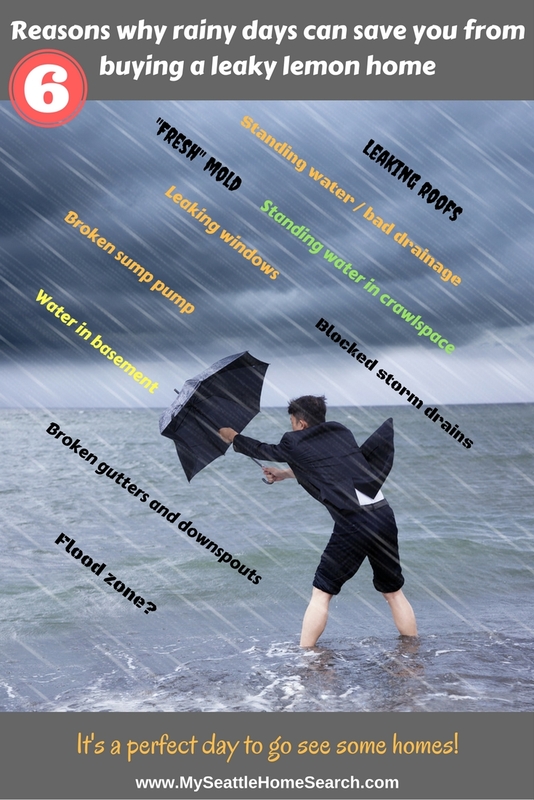 So, how can rain be of benefit to a home buyer? Reason #1: Rain will help determine if the roof is toast or badly installed. As one of my home inspectors loves to quote, 1 inch of rain will unload 1000 gallons of water onto an 1,800sf roof with 4 downspouts (250 gallons per gutter). And all that rain has to go some place... preferably not into the home, attic, basement or crawlspace. For some roofs you can tell it's completely shot just by standing on the ground and looking up...missing tiles, lots of moss, curling up tiles, tiles of different colors (home owner repairs) or missing flashing. If there's an older layer under the existing layer there might be some hope that the attic is still dry. But don't hold your breath. For other roofs, you will need to climb up and take a better look to determine if the home needs a new roof. Disclaimer: I, Conor MacEvilly, hereby state that I am not recommending that you climb up on the roof in 40mph winds on a rainy day. If you decide to buy the home and you choose to go up there with your inspector, so be it. Also, don't sit in a full bathtub and use a hair dryer. Just because it's a newer roof doesn't mean it's a reliable roof! If the roof was not installed properly in the first place then it's a defective product. Who installed the roof? Was it a handyman or a licensed, bonded and insured roofing contractor and comes with a transferable warrenty? Infamous LP siding was way easier to install than a roof and look where that ended up! The roof might look pretty but is the flashing done right including step flashing around the chimney and vent pipes. Did the sellers have it power washed by Bob the handyman who removed 10 years of life off the roof (the gutters will be full of that roof granules from composition roofs)? Does the roof have vents and soffits for ventilation? Rain with a strong wind behind it will work it's way into any little nook and cranny and into the attic space. So now it's time to pop yourself into the attic for a good look. Do you see any active leaks / water on the plywood sheeting under the shingles? 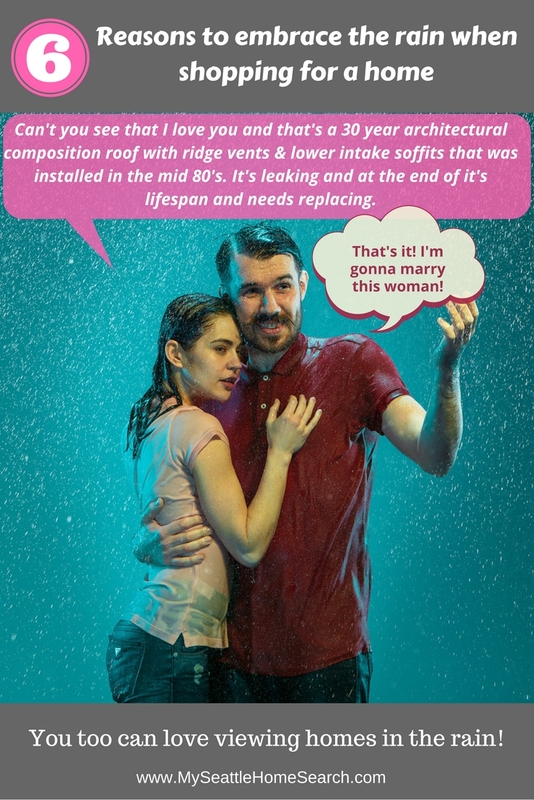 Does any of the insulation feel wet? Are there areas of extensive dark staining on the plywood or any obvious signs of mold? Note that some of the latter can be caused by bathroom fans that are not properly vented through the roof and just unload all their moist warm air into the attic space. Mold will line up around the block for that good stuff! Also, if it's a cheap roof job, the "roofer" might have overlooked adding any ridge vents to allow that moist air out of the attic. On a related note, badly installed roofs will have gaps that allow critters like rats to move in lock stock and barrel into the attic space and start raising their families. So keep an eye out for them too while you're up there. Reason #2: Will help get your mind in the gutter (and downspouts too). If the function of the roof is to keep water from getting into the attic and the home, the function of the gutters and downspouts is to get alll that rain water away from the home as quickly and as far away as possible. People who say "get you mind out of the gutter" obviously haven't shopped for a home on a rainy day. A healthy blast of rain will expose bad gutters in a jiffy. Are the gutters overflowing at the brim, leaking at the corner joints or even worse the rain is completely bypassing the gutters and cascading down behind them? Are there any actual gutters in place including over the entrance areas? Sounds like a stupid question but don't take it for granted that there are actual gutters in place. Are the gutters securely connected to the fascia board so they properly capture the rain runoff from the roof? Are the gutter full to the brim with leaves, pine needles or resembles a starter P-Patch. Are there actual down spouts connected to the gutters or is the downspout leaning against the wall a few feet away (while also sitting on a certain someone's honey-do-list)? Or are the downspouts plugged with muck? Most importantly, where do the ends of those downspouts empty into? Are they connected to storm drains or do they just dangle there unloading oceans of rainwater beside the home's foundation? I love those little two foot long plastic diverter thingies that people place under downspouts. They are completely useless at moving water away from the foundation, particularly when the land is sloping right back to the home. Obviously, if the home is located within a flood zone or close to a river that is known to overflow it's banks, then you might want to reconsider buying that home. When considering purchasing a particular home, it is always a good idea to walk around and get the lay of the land and lay of the surrounding neighborhood. You don't need an engineering degree to know that water flows down hill. If the home is sitting at the bottom of a hill then water is going to be flowing towards that home from all sides. If the land slopes towards one side of the home, then water is going to flow towards that side of the home. It's a good idea to check if there are any drainage systems in place to divert that water away from the home's foundation, for example an exterior French drain or an inetrior basement footer drain. You didn't bring those gumboot for nuthin'! Don't stay on the nice clean concrete and paths...walk onto the grassy areas...are they excessively muddy, water logged or have standing water? The the soil might have poor drainage or your home is sitting at a low spot where water collects or sits on a high water table. If so, potentially that is not good news for the foundation, and hence the basement or crawl space. One side of a home will get battered by a lot more weather than the other sides. For example, for Seattle homes, the south facing sides of homes are exposed to the worst of the weather during the rainy months. For my own 1932 brick Tudor home, the original wood window frames look like that have been through the wars and the red bricks are pitted in places. The chimney on the south side gets especially picked on by old Mother Nature. But when you look at the north side of the house, the bricks and window frames are as smooth as the day they were installed. Why is this important? When out looking at homes or inspecting them with a professional inspector, it's likely that the side of he home exposed to the most wind and rain will have the greatest potential for water issues. Although as my home demonstrates, you don't need a rainy day to tell which side gets the majority of the bad weather. However, a few days of copious rain might help you and your inspector uncover any on-going water issues on that side of the home that might not be evident during drier times of year. If the home has a basement and while on your outside tour of the home you have already seen some signs of potebtaul water issues, then there's is a good chance they will translate into the basement problems as well..
You won't need your eyes for the first giveaway of potential water / moisture issues..... does the basement smell moldy and damp? It's a very distinctive smell that everyone notices straight away. Besides being an indication of moisture issues with the home, more importantly some mold can have major health implications and needs to be identified and remove. Walk around the perimeter of the basement and see if you can see any damp spots either on the unfinished concrete or on the carpets. Can you see any areas with mold? Pay particular attention to those parts of the basement where the land slopes towards the home or a downspout is not connected to a storm drain. If the basement is unfinished, take a look at foundation walls and see if you can spot any efflorescence. What's that you ask? Efflorescence is a crystalline deposit on concrete and masonry due to water slowly seeping thorough the concrete and depositing salts on the interior surface as the water evaporates. The surface will be crumbly to the touch. Efflorescence may be indicative of a chronic drainage problem especially if there are no drainage systems in place. However, it can be hard to determine if those salt deposits are 5 years old or are still ongoing. However, but combined with other findings, this tell tale sign helps add to the evidence of a home with water issues. Do the owners have a dehumidifier running on high... might (but not guaranteed) be a sign of moisture issues in the basement. Also, do they have a plug in Tropical Breezes edition of Fabreeze on over-drive? Just might be trying to cover up moldy / damp odors. Never trust a home with air-freshener plugins I say! If you intend to buy a home with known water / moisture problems and more importantly want to remodel that basement, then you will need to to look at the common solutions for wet basement problems. Zero out of 10 home inspectors love going into crawl spaces and neither do I but it's a critical area that needs a proper inspection. If you are just out checking out homes you are not expected to jump into the crawl space and start investigating. Leave that up to your home inspector. But you can pop the access door and stick your head and nose in if you like. 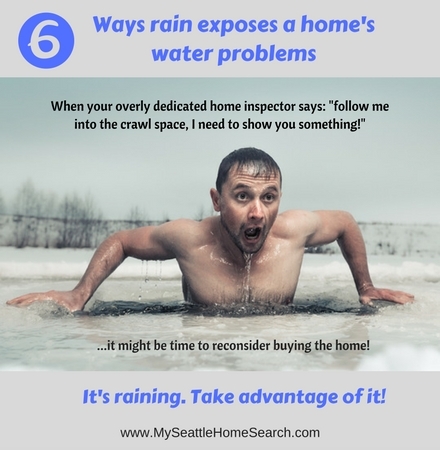 A few days of good rain will help expose any issue with crawlspace that you will not see during the dry summer months (unless the seller obsessively waters the lawn). Is there standing water down there? Does it have a sump pump and if so, is it working properly? If not, that water has no place to go and likes to start evaporating upward into the home above. Even if the crawl space has vents around the side, not all the water will evaporate through them. One little tell tale sign of a home with crawl space drainage / ventilation problems to look out for: if the main floor of the home has wood floors, then the sides of the boards will start curling upward. Referred to as cupping. The wood is being warped by mositure evaporating from the crawl space below. Pull back the vapor barrier and and see if the soil beneath is wet. While the inspector is down there have them check other items such as is the dirt fully covered by vapor barrier, are vents / plumbing properly insulated, is the insulation under the floor joists in good condition or are there are critters living down there? Crawlspace are scary, dark and damp places and most home owners prefer avoid ever going near them. Make sure you don't when buying a home. So yes, rain is not top of everyone's favorite weather. Perosanlly, give me sunshine any day of the week. But as I hope you can see, when you are out shopping for a home and about to make a big, long term financial commitment, a little help from Mother Nature can protect you from ending up with a lemon of a home. Keep those gumboots handy! The top 10 Red Flags to Look for When buying a Home from Kyle Hiscock.